You will earn 5,672.55 Reward Points. Earn 1 reward point for every 1 dollar spent. The Turbo-Air TOM-40B-N is a refrigerated merchandiser with a vertical open display perfect for encouraging customers to pick up an extra bottled drink or pre-packaged sandwich. This is a self-contained unit designed for convenience stores, delis, and other commercial establishments. This unit’s black exterior has an open front fitted with a front shield and side walls made of safety-reinforced tempered glass. The interior is all-stainless steel, including the back wall, shelving units, and deck pans. An optional stainless steel front panel is available for an extra fee. 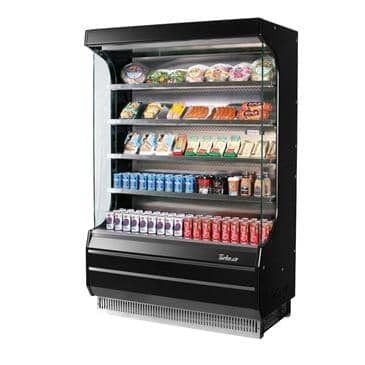 At 39” wide and 28” deep, the Turbo-Air TOM-40B-N provides plenty of space for displaying food items and beverages. The maximum capacity for this merchandiser is 12.5 cu. ft., with (4) adjustable solid shelves to help you make the most of the space. Price tag channels may also be included with the shelves for a fee. Bright and attractive LED lighting provides extra illumination for your products to help draw customer attention. LED lighting does not consume as much energy as fluorescent lighting and releases far less heat. This unit uses foamed-in-place polyurethane insulation to ensure that cold air stays inside the interior. An energy-conserving night curtain is available to provide a secondary barrier that keeps warm air out when the establishment is closed. An optional security cover is also available at an additional charge. The Turbo-Air TOM-40B-N uses Turbo-Air’s patent-pending self-cleaning condenser, a technology that ensures zero dust buildup and maximum system performance at all times. The condenser is fitted with a rotating brush that moves up and down the coil 2 to 3 times per day. It is protected from larger particles using a fine mesh wire filter that traps dust, dirt, and bugs that may have been pulled in by the evaporator fan. The unit has a perforated interior back wall and top that encourages maximum airflow and balanced cooling. The standard back-guard also contributes to improved circulation to eliminate hot spots that may cause spoilage. The Turbo-Air TOM-40B-N is cooled using 404a refrigerant, a CFC-free hydrocarbon refrigerant that does not emit substances that contribute to the depletion of the ozone layer. This merchandiser has a voltage of 115v/60/1-ph. It runs on twin 3/4 HP compressors. This unit is certified by cCSAus and CSA-Sanitation.